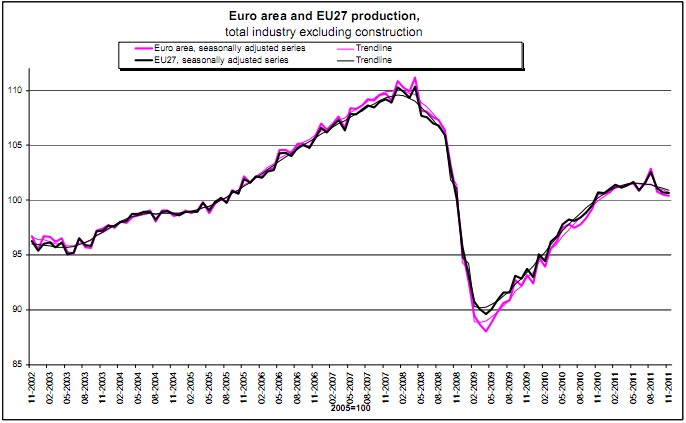 Eurostat has published November numbers for industrial production (graph above). 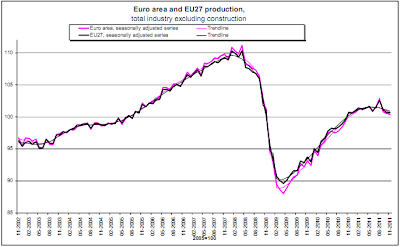 It continues to look as though Europe is in the early stages of a recession. it looks like Italy should have a severe recession. There is often a discussion here technology and automation reducing the number of jobs. But isn't the converse also true? If industrial output decreases there isn't the dramatic reduction in total employment we've seen in past recessions? Of course that means that with less goods being sold there are less people employed with the distribution of those goods. Though the people doing this are being automated away as well. I just don't know what a few percentage drops in a graph of this sort mean anymore. I think my understanding of economics stopped at about a 1970 time period. I see these numbers all the time and the reality on the street doesn't seem to have anything to do with this, or what wall street did the past few months.